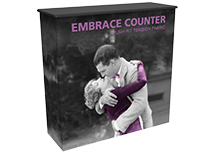 Fabric tension counters offer the most modern look for a portable counter. 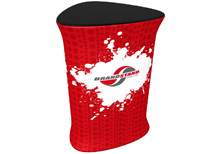 We use stretch fabric graphic to create unique looking counter that will stand out. Our most unique counters are the iPad and Tower Counter. The iPad counter will hold an iPad 1 or 2 and has a built in speaker to play audio. 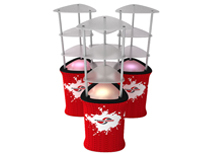 The triangle tower counter acts as a product display with optional under lighting. 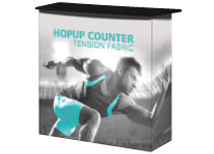 The most durable fabric tension counter we offer is the Hop Up counter which has internal shelving and can hold up to 50 pounds! 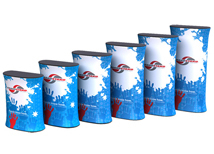 All of our fabric tension counters include custom printed graphics that will not only add branding to your counter, but create a custom look that no one else can copy. We offer multiple options for height, accessories, and internal shelfs to fit any show requirement. Our fast turnaround and low prices will make these counters an option for any company in a time crunch or on a budget. 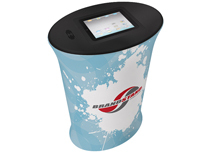 Counters are a great accessory to any booth space because they offer another branding opportunity closer to the isle way and offer functionality such as a help desk or information center. The Hop Up counter is one of our favorites because it can hold a lot of weight and offers storage. Its very easy to assemble and is extremely durable.